If you read the introductory post to a year of spiritual disciplines, a.k.a. Twelve Months of Grace, you would know that the first spiritual discipline for September is that well known spiritual discipline of ‘Creation’. Ok, maybe I haven’t found that spiritual discipline in any of the books I have looked at for ideas on spiritual disciplines, so why did I choose Creation as one of the twelve? I believe that failure to engage with God in creation is one of the greatest failures of the church today. To engage with God only within limited spaces created by man is like only eating microwaved food. It is perfectly possible to live that way but nobody who has tasted anything else would settle for it. And yet many people I know, me included, fail to make a regular habit of engaging with God in creation. Most people spend more time in front of man-made screens than in front of God-made creation. And that is literally sucking the beauty out of our lives and destroying our souls. I am not against screens - I just know that my own life is out of balance and I am assuming I am not the only one! 1. God is the Creator God. He originally designed creation to be the context for relationship with Him. When He made the world, God didn’t build a house and place man and woman in it, He planted a garden. A living, breathing, growing, changing, beautiful, interactive garden. That was the original context for His relationship with man. When I am out in Creation I am continually amazed by how God designed so many varied and beautiful things for the place where He created us to have relationship with Him. I cannot look at the perfectness of plants and animals and sunrises and mountains and fail to be in awe of Him and His love for us. Just as I feel loved when my husband Mark plans something thoughtful he knows I will enjoy, I am romanced at the thoughtfulness and preparation that went into God’s creation for us to enjoy. When I sit in front of a wide sky as the sun comes up over the horizon, I am wowed and wooed at God’s faithfulness to bring round the sun to my part of the world again. The sunrise reveals to me an attribute of God: His faithfulness. As we engage with His creation, He is revealed. I have been struck how I try to imitate Jesus in many ways, but have never looked at the time He spent engaging with His Father in Creation as something to imitate. This is something I am hoping to change this month. When Jesus was teaching His disciples and the crowds, he often talked to them in parables and stories using the natural things that were around them that they could see. He talked about the parable of the Sower and the seeds growing up in different types of land, about leaven in bread and birds in the sky. He pointed out the lilies and the mustard tree. He connected His teaching with things people would see in their normal lives so that they would continue to meditate on His words when they met with the examples in real life. The Word came alive as they engaged with it in Creation. One of the things I have begun to do and plan to do more this month is to read the Bible outside - to read about the things Jesus did by the sea as I sit by the sea, to spend time looking at the birds and think about His provision for me. Reading the Bible in creation is a way of bringing the Word alive and engaging with God in new and meaningful ways which will be remembered and treasured. So this month I am going to have an intentional plan to engage with God through Creation. I plan to spend some time each day with God outside - not always outside of my house, it may be in my garden, but outside of the concrete walls. I am planning to spend time outside in different places and at different times of the day. I am planning to spend time alone with God in creation and with others like my boys, engaging with God and His Word together. - Go on a walk outside just you and God. If possible maybe take a full day to walk together. - Put a photo you took of some aspect of creation on your screen saver of your phone and pause before turning it on to reflect on it and allow it to draw you towards God. - Put up photos / calendars of places in Creation in your home. - Walk around the neighborhood with your kids / a friend and thank God for the different elements of Creation present. - Go on a 5 senses walk in nature, intentionally paying attention to each one of the senses in turn - listen, smell, feel, touch, taste! Give thanks to God for the different things He has created. - Take a walk with a toddler, walk at their pace and watch what fascinates them about Creation - go bug collecting with them and talk about how amazing God was to make all the different bugs! Looking forward to sharing about Creation with you on the blog this month. Please do tell me about any adventures you have with God in creation this month - post comments or photos in the facebook group - I'd love to see them! 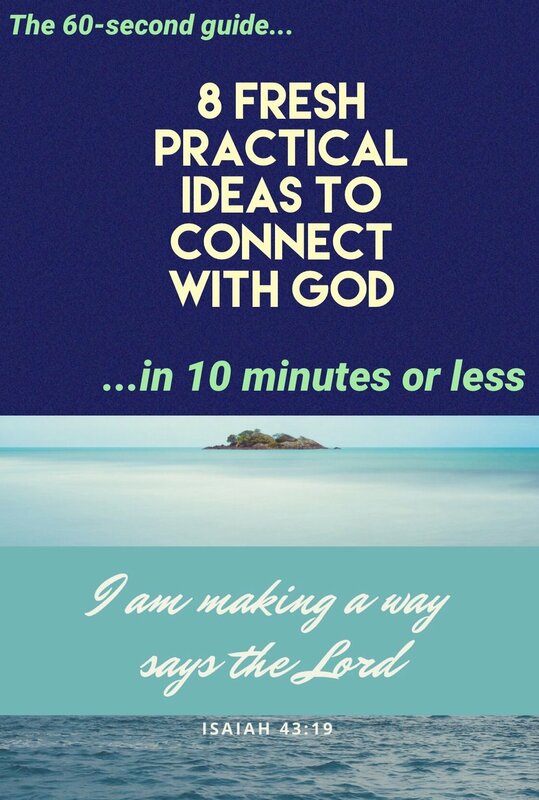 Don't miss a post in this new Spiritual Disciplines series! Join many others to receive posts straight to your inbox! See you soon! Please check your inbox to confirm your subscription! Click here for a free printable to help you intentionally engage with God this week.